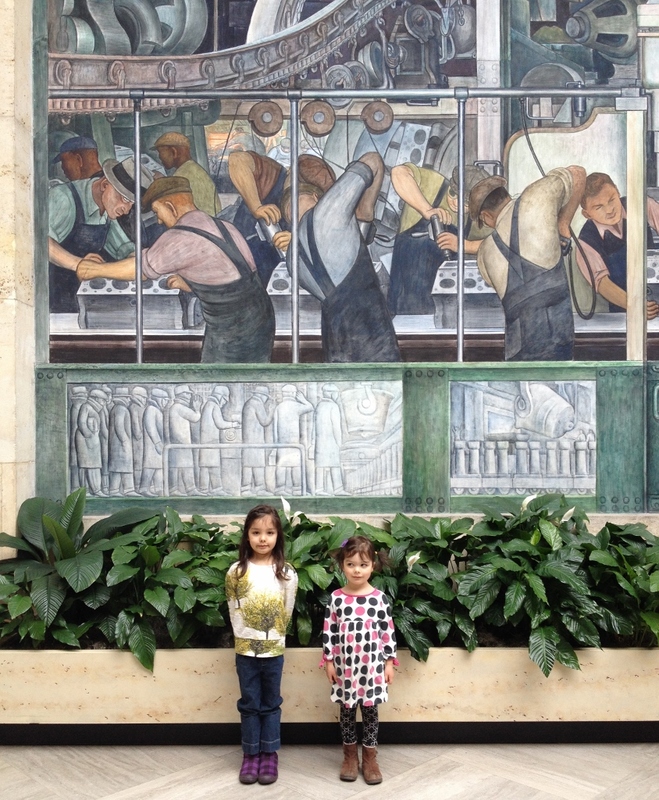 In front of a Diego Rivera mural. We finally made it to the Detroit Institute of Arts (aka the DIA), the museum that was in the news the last couple of years in regards to Detroit’s bankruptcy filing. In the summer of 2013 it was thought that creditors might force the DIA to sell some of its collection (appraised up to $867 million). Luckily, the DIA made a deal with the city, committing to raise $100 million over the course of 20 years, saving them from having to break up its collection. But on with our story. One snowy Spring Break morning (ahhh! ), we bundled up and headed downtown. 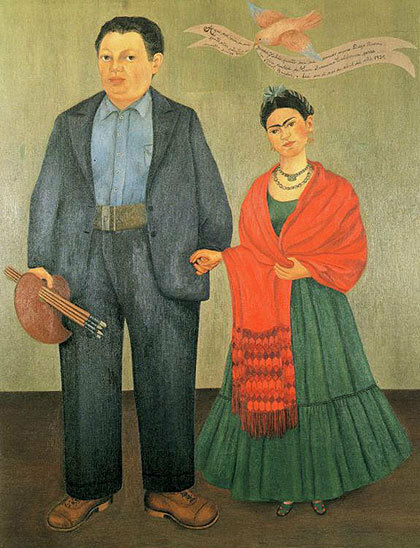 We were there during the Diego Rivera and Frida Kahlo special exhibit, which was pretty cool. We zipped through it pretty quickly, though, because our littlest was having a snack meltdown (I want to ride the elevator! Can we go now?! When can we ride the elevator? Etc). I am actually not a huge fan of their work (except for Diego’s murals), but seeing the exhibit was inspiring, nonetheless, and it made me want to draw again (as a kid and young adult I used to enjoy sketching and painting. Once I hit my 30s I kind of stopped). Can’t remember if this was there, specifically. But there were child portraits. The preparatory drawings for the murals were my favorite. After a small snack, we rode on the elevator, played some I-Spy in the European decorative arts gallery (there are several I-Spy questions and clues scattered throughout the museum), walked through the Dutch gallery, rode on the elevator again (surprise) and had lunch in the Kresge Court (a cool cafe that sits under a glass roof). 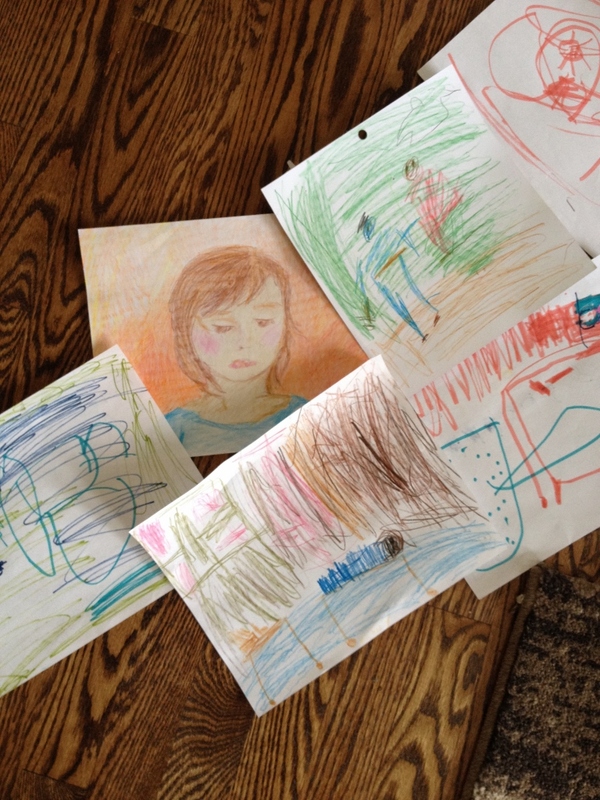 That afternoon the girls and I worked on drawings inspired by the Diego/Frida exhibit. The girls seemed genuinely excited about the project (and it kept them busy!) and it was really fun for me, too. 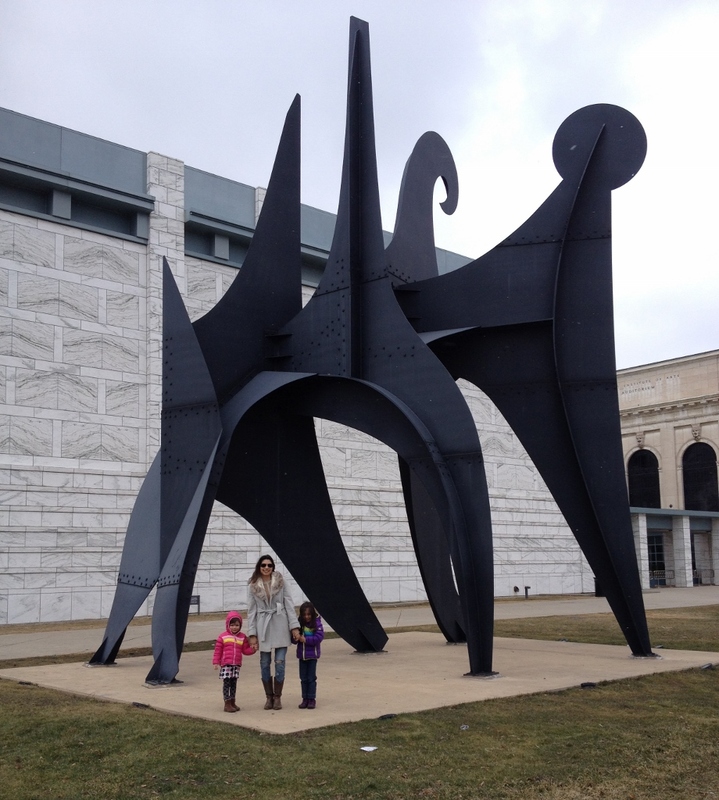 This entry was posted in Detroit, Fun and tagged Art Project, Detroit Institute of Arts, Diego Rivera, Frida Kahlo, Inspiration, Kids, Museum, Painting, Special Exhibit. Bookmark the permalink. ← March List Correction: Coconut Shake was $15 (not $10) omg!! Love museums. Such a gift. Glad to hear that Detroit saved theirs! I’m so happy that you enjoyed the DIA. It’s a treasure. Thanks so much for the membership – such a great gift!